Building an X99-based machine and want a great “sweet-spot” motherboard? 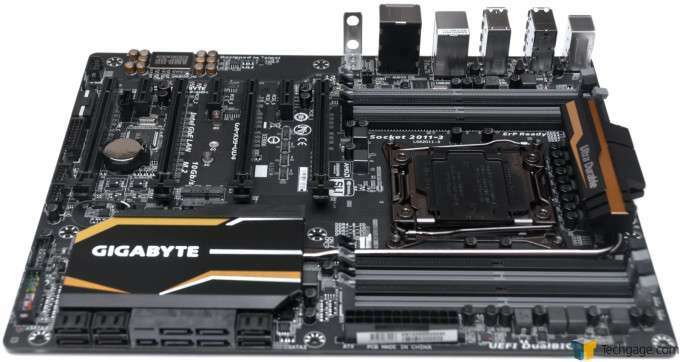 GIGABYTE’s X99-UD4 is well worth the consideration, as it delivers a lot of functionality for its <$250 price-tag, tosses in a couple of extras we might not “need” but do appreciate, and sports a solid design. Let’s check it out. 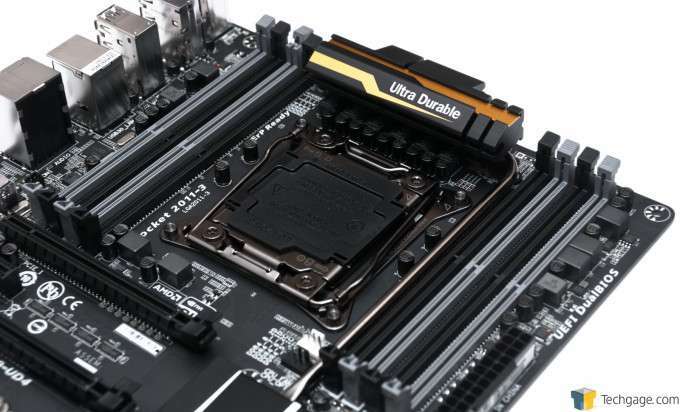 Since posting a look at ASUS’ X99-DELUXE in February, I’ve been anxious to talk about another X99 motherboard I’ve spent quite a bit of time with: GIGABYTE’s X99-UD4. Based on the fact that you’re here reading this, you’ve probably surmised that I’m going to take care of that now. Similar to the goals of ASUS’ DELUXE series, GIGABYTE’s UD, or “Ultra Durable” series aims to offer well-rounded solutions that don’t cut corners. 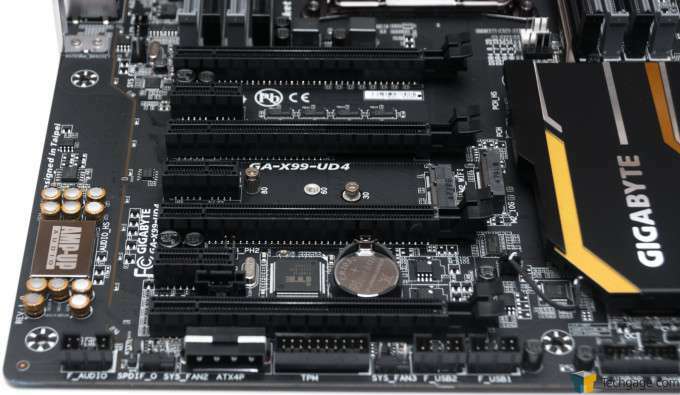 Being that the UD4 I’m looking at here is an X99 one, it goes without saying that it’s going to be beefier than most mainstream boards, and that’s something its ~$250 price tag could also allude to. The UD4 is designed for those who want to go the route of a high-end platform but don’t need to go over-the-top. Part of that means it has no wireless, but it still does have an M.2 slot, as well as support for SATA Express. Oh – and 64GB of fast DDR4-2800 memory. 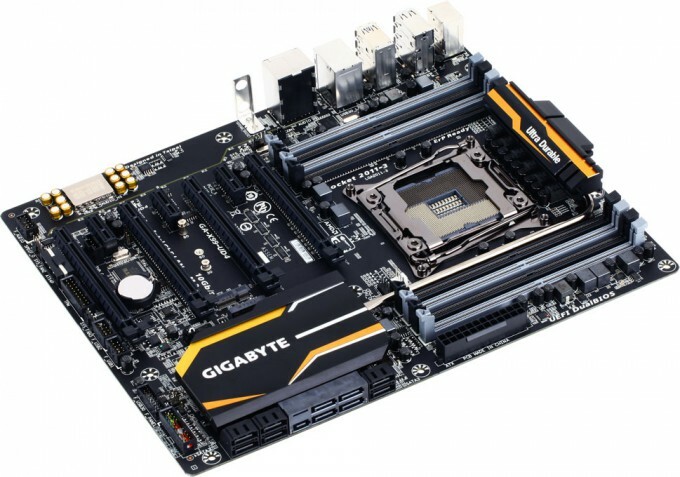 Like the rest of GIGABYTE’s X99 UD boards, the UD4 sports a black base color with gray and gold accents. The X99-UD4 doesn’t just pack a ton of features into its modest ATX frame, it also sports a smart design. I appreciate boards that don’t settle some important connectors inward, or at odd angles. 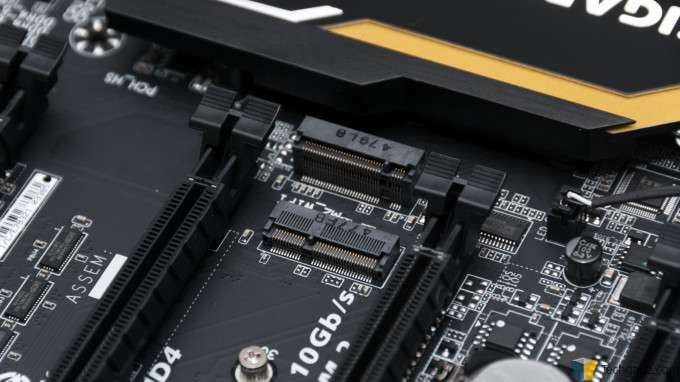 The 8-pin motherboard connector should prove accessible for almost all builds, and the same goes for the chassis connectors. 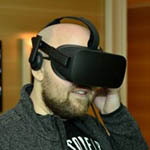 Beyond that, those wanting to take the quad GPU route will have ample spacing for that. A couple of things to note about the UD4 is that it includes an x4 M.2 slot, so you can equip yourself with one of the fastest SSDs going. If you don’t want to go that route, you can install a Wi-Fi card instead, although if you have enough PCIe slots left over, that’d be another route to take for that. 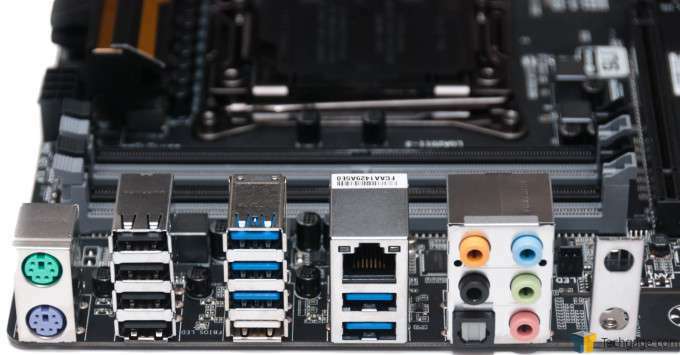 If you don’t use SATA Express, you’ll have 10 SATA ports to take advantage of, and at the back, there are 10 USB ports, with a mixture of 3.0 and 2.0. On paper, the feature set looks great, but a visual tour is often better. Let’s get on it. 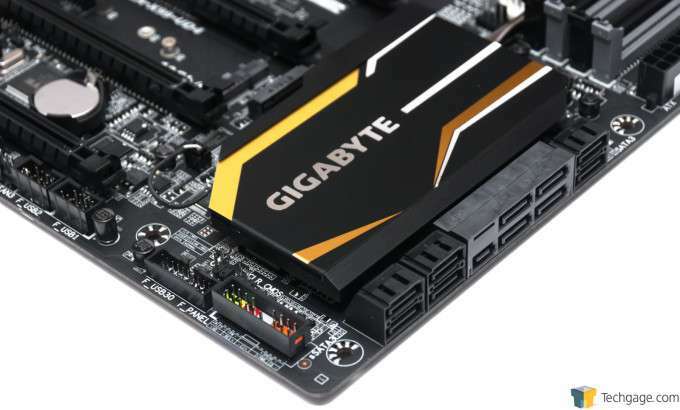 As mentioned earlier, GIGABYTE’s X99 Ultra Durable series all have a black base color and are accented by gray and gold. Personally, I love clean aesthetics like this. If you want something a little flashier, the company’s Gaming or SOC series might be worth a look (the SOC series in particular has an awesome orange theme). At the bottom-right corner of the UD4 we find the 10 SATA ports (2 will become occupied if SATA Express used), as well as the chassis connectors and USB headers (1x 3.0, 2x 2.0). At the bottom left of the board is its audio card, a Realtek ALC1150 offering that supports up to 115dBA and has a built-in amplifier. 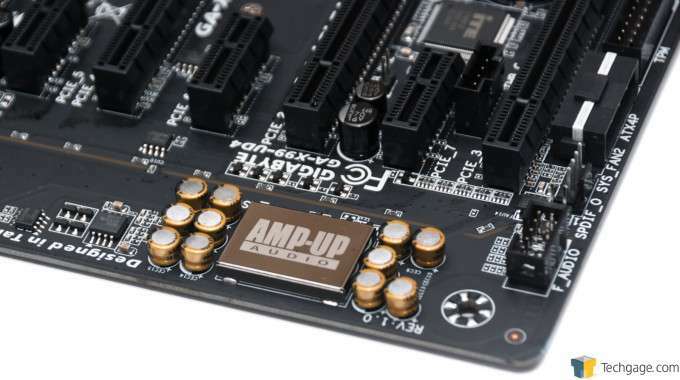 Interestingly, GIGABYTE separates the left and right audio channels by putting them on separate PCB layers. That doesn’t meant that the solution only supports stereo, though: 7.1 support is there if you need it. 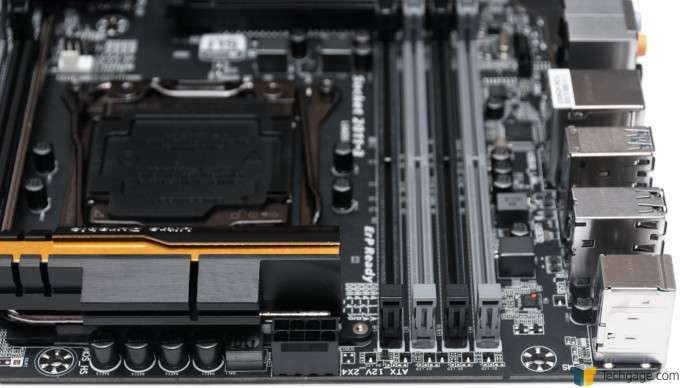 Four x16 PCIe slots are provided on this board in addition to a trio of x1 slots. In between them all, you’ll be able to spot the M.2 connector. Also here are two 4-pin fan headers. Before moving on, it’s worth pointing out the hard-to-read “ATX4P” port in the shot above. This is for use with a 4-pin Molex connector, and is recommended by GIGABYTE if you’re using two or more graphics cards. I’d have to imagine that with two cards, you’re never going to run into a problem, but if you have a Molex connector lingering around, it won’t hurt to plug it in. With three or four GPUs, I’d consider it important to utilize this extra power source. Up at the socket area we can find the… socket, as well as the 8 DIMM slots. Two 4-pin fan headers can be seen to the bottom-right of the socket. Another header can be seen to the left of the first set of DIMM slots. And here’s a close-up of the M.2 connector. With it, you can install a Wi-Fi module, or even better, a ridiculously fast solid-state drive, such as Samsung’s SM951. There’s not too much to see at the top of the board, but I did want to highlight the simple fact that the 8-pin motherboard connector is very accessible. GIGABYTE seems to have a knack of occasionally placing this connector in an odd manner (either up and down or inside the board an inch or two), so I was glad to see a normal implementation here. For back panel connectivity, the UD4 offers dual PS/2 ports, 6x USB 3.0 and 4x 2.0, a single LAN port, as well as a full complement of audio jacks. To the right of these is a mount for a Wi-Fi module, should you end up installing one (I am not entirely sure these are common). 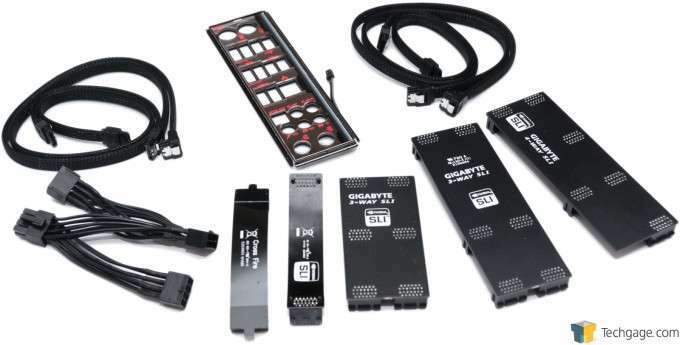 In way of accessories, GIGABYTE includes four sleeved SATA cables (a nice touch), a CrossFire bridge, and an impressive four SLI bridges, with two being designed for 3-way configurations that have different gap lengths. Two unique components in this picture include the I/O panel and also the 1-to-3 power cable. On the I/O panel front, you can plug the little cable into the motherboard to activate its LED lighting, while the cable is to be used if you are going to be doing some extreme overclocking. To take advantage of the feature, you’d plug this cable into the board’s lone 8-pin motherboard power port, and then populate the three ends with cables straight from the power supply. It probably goes without saying, but this will not be a commonly used feature. Overall, the X99-UD4 is a great-looking motherboard and I can’t manage to complain about much of anything. If I really had to dig deep and come up with something, it’d be that I’d like to see the board offer 6x 4-pin fan headers. For some, 6 headers might not be needed, but if it adds another header to a different spot on the board, it might be more convenient than what’s already there. With the hardware tour tackled, let’s check out the X99-UD4’s software.